The things that make industrial outdoor lighting stand out from other forms of lighting is their durability, and flexability to be used just about anywhere. Although different types of industrial lights are used for various applications, one thing remains in common. All industrial lighting must be designed to withstand the abuse to which it will be exposed. Often industrial lights are very bright with a wide angle beam spread. This means that they produce a lot of light spreading out over a large outdoor area. Therefore, a quality light shield is important to help in directing the industrial lamp's light output to where you need it most. By moving the shield you can direct the light output for your needs. 1) It allows the maximum amount of light to be directed wherever necessary. 2) It prevents light from spreading in all directions causing glare and light polution. 3) It protects the lamp from being directly exposed to the outside environment. Industrial lamps vary in wattage and voltage just like traditional lamps. Typically you will find that commercial outdoor lamps will be used in industrial outdoor lighting fixtures. Their brightness and durability make them ideal candidates for industrial lighting. Since they won't be used for decorative purposes, commercial outdoor lighting fixtures are sometimes used for industrial lighting purposes. Industrial work sites are sometimes more susceptible to work conditions that could lead to a much larger scale catastrophe. Outdoor emergency lighting in an industrial work environment is often required as a precaution to help contain any unfortuate events. 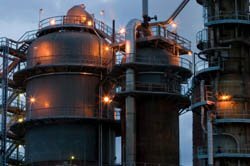 In these industries, a small event could do massive damage to the industrial facility and the surrounding environment if not contained in time. Some industrial fixtures will come equipt with a locking mechanism that can be easily locked and unlocked. This gives you the freedom to easily move the lights in the necessary direction and lock them in place, so once they're set they stay that way. To protect the lamps, a light cover is necessary. The lamp's housing should prevent water from getting into its base where it can damage the electrical connection and cause a short. Make sure that it has a rubber gasket to prevent any moisture from getting inside. The portability of industrial outdoor lighting can be important to the job at hand. 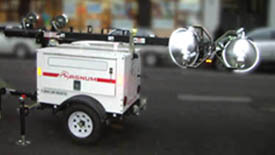 Job sites requiring such portability can make use of tow away lighting. The fold away arms allow for quick and easy storage. Its also an easy way to transport the unit from place to place. Their built in power supply, usually in the form of an industrial quality generator provides an abundant amount of power so you can easily get your job done. When you're all done, just hitch it onto the back of your truck and tow it away with ease. It takes up no extra space inside your truck and doesn't require any heavy lifting.